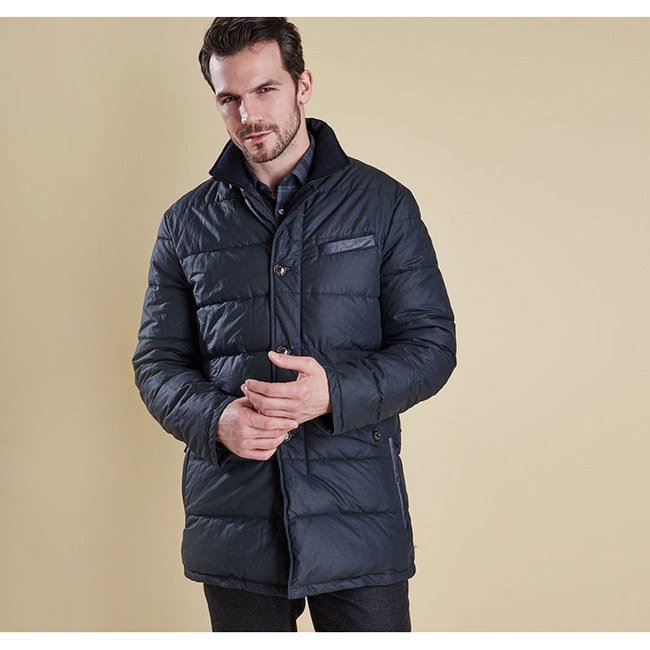 From the Barbour x Land Rover collection, this baffle-quilted men's jacket has a fibre down filling, for superb warmth without weight. Wool and leather trims add luxurious touches, and a ribbed insert to the inner collar offers extra warmth. At first when I wore the jacket, I felt comfortable but tight, cozy. No need for extra layers. Good. The problem is it's to warm. I purchased for work outside and I'm sweating constantly. Anyone knows that if you sweat and it's cold and snowing, you won't be able to stay comfortable. Next, it says waterproof on my inside tag, in addition to the heat factor, while working in a snow event that eventually turned to rain, I was surprised when though the seams and on top of my shoulders the water was coming through. Not Happy. Phone pocket was also soaked even though it has a special type of zipper. Nothing in life is a given however, this item is not as advertised in my opinion. Be aware of your intended needs and don't compromise price for comfort. This jacket is perfect. I am 6-6 and the fit is exactly what I want. I highly recommend it to my fellow tall people.